Canton - Robert Earl "Bob/Bobby" Davis went home to be with the Lord October 29, 2018 after a long illness. Bob was born in 1934 in Offerman, GA to Lester and Martha Davis. He was proceeded in life by both of his parents; his siblings, Doris Ivory, Anna Bell Trowell, and Clyde "Buddy" Davis; and his Beloved Grandson, Bobby Ager. He moved to Hollywood, Florida as a teen where he was a graduate of South Broward High School and proudly married the love of his life and soulmate of 61 years, Carol Ann Carroll, in 1957. He served in the National Guard. Bob loved all things mechanical. He loved racing dragsters and was an IHRA World Champion. The racing world knew him as "Mr. Lucky" #5 which he earned by his love of winning. One of his and his family's proudest moments was his induction into the Miami/Hollywood Speedway Park Hall of Fame in 2014. In Bob's later years, he enjoyed riding his Harley with family and friends. 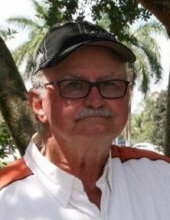 Bob retired in 1989 as the Chief Mechanic for the City of Hollywood at which time he moved to Cruso, NC where he had a family vacation home since 1976. He loved his wife, children and grandchildren with all of his heart. He is survived by his loving wife, Carol Davis; his daughter, Debbie Davis and fiancé Jerry Krawczyk; daughter, Denise Boggie and son-in-law, Christopher Boggie; and daughter, Darlene Smith and fiancé, Wayne Cabe and children. His grandchildren: Thomas Mammarelli, Brittney Zarczynski and husband Jordan Zarczynski, Bradley Cento, Nick Mammarelli, Elizabeth Mammarelli, Danielle Smith, Chase Boggie and wife Mikal Boggie, and Paige Boggie; and by his great grandsons, Grayson and Griffin Boggie and Baby Zarczynski, due in January. He is also survived by his siblings, Maggie Medlin of Lake City, FL; Joseph and Lory Chancy of Lake City, FL; and sister-in-law, Donna Davis of White, GA. In addition, he is survived by his many nieces, nephews and family members. Bob lived a much fulfilled life and will be missed by many, but most importantly by his family. Funeral services will be held at 2:00 p.m. on Friday, November 2, 2018 in the Canton Chapel of Wells Funeral Home with the Reverend Adam Guice officiating. Burial will follow at Cruso United Methodist Church Cemetery. The family will receive friends from 12:45 until 1:45 p.m. prior to the service at the funeral home.